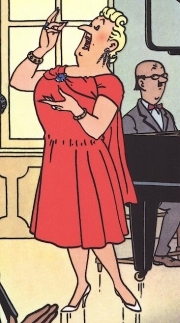 Bianca Castafiore, the "Milanese Nightingale", is a fictional character in The Adventures of Tintin, the series of classic Belgian comic books written and illustrated by Hergé. Her forename means "white" in Italian, and her surname is Italian for "chaste flower". 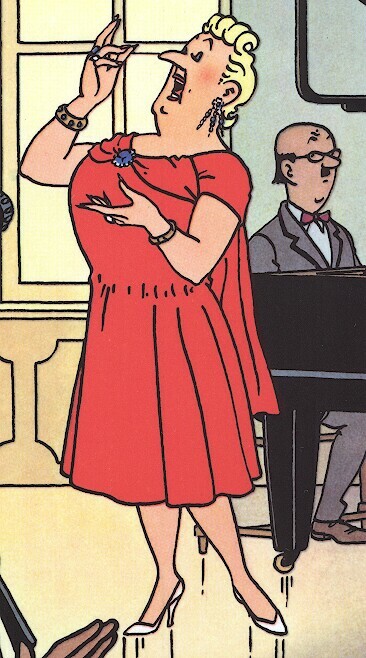 The comical Italian opera diva first appears in King Ottokar's Sceptre, and is also in The Seven Crystal Balls, The Calculus Affair, The Castafiore Emerald, Tintin and the Picaros, The Red Sea Sharks, and would have appeared in the unfinished Tintin and Alph-Art. She is played on radio in Tintin in Tibet, Captain Haddock imagines her singing in Flight 714. Although apparently one of the leading of her generation, the only thing that Castafiore is ever heard to sing are a few lines of her "signature aria", the Jewel Song, l'air des bijoux, from Faust, always at ear-splitting volume (and violent force - certainly enough to part the Captain's hair, and a breeze enough to blow back a curtain in an opera box - 'She's in fine voice tonight.'). When on tour, she usually travels with her piano accompanist, Igor Wagner, and her maid, Irma. At odds with her reputation as a leading opera singer, in The Seven Crystal Balls, she is appearing third on the bill of a variety show, along with a knife thrower, a magician and a clairvoyant. She is depicted as a preening, melodramatic diva, although she has a kind heart. In The Calculus Affair, for example, she provides a diversion to distract the sinister Colonel Sponsz so that Tintin and Captain Haddock can escape and rescue their friend Calculus. A recurring comic trope in the series is Haddock's aversion to Castafiore, who can never remember his name . Ironically, gossip journalists reported a romance and engagement between Castafiore and Haddock in The Castafiore Emerald, complete with Castafiore showing a disgruntled Haddock the flowers in his own garden. This quite chagrined the captain, but not the diva, who was quite used to such inventions from the tabloids. Her visit to Haddock was correctly predicted by a Gypsy fortuneteller. Thus, ancient mysticism is proven far more accurate than the modern news media. Bianca was once falsely imprisoned by the South American dictator General Tapioca and General Sponsz in order to lure Calculus, Haddock and Tintin to San Theodoros where they prepare a deadly trap for them and Tapioca's rival, General Alcazar. Their ruse backfired, not least because Bianca expresses her contempt of her show trial and her life sentence with her trademark ear-splitting rendition of the Jewel Song. The court has to be cleared. In prison, Bianca makes her jailers suffer even more by throwing her pasta over their heads because they do not cook it al dente. Whole or part of the information contained in this card come from the Wikipedia article "Bianca Castafiore", licensed under CC-BY-SA full list of contributors here.